Food photos on Instagram: What’s the best way to photograph food in a restaurant? What’s the Best Way to Photograph Food in a Restaurant? 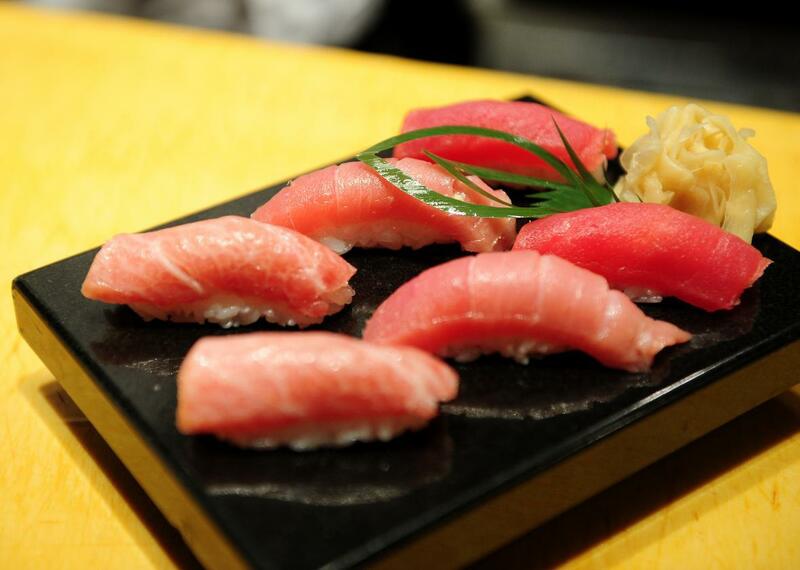 Consider positioning sushi at an angle. I take all of my food pictures (even the ones that show up on my Instagram account) using the camera on my smartphone or, if I’m at home, the camera on my tablet. Even for the pictures on Instagram, I try to do as little editing as possible. So, while I don’t have recommendations for a camera, I think that you can still take wonderful food pictures without using an expensive or high-end camera. Here are some tips specifically for taking pretty and mouthwatering pictures in restaurants (especially those that are more formal than, say, a casual cafe). Don’t use flash. It’ll wash out your pictures and can be distracting to others sitting around you. Instead, try to get better lighting by adjusting your or the food’s position in relation to existing lighting. If there’s not a lot of light, you can combat this either with photo editing tools like Instagram or VSCO cam or find a nice friend who will use a flashlight from his or her phone to provide some (adjustable) lighting. Lighting is important. In most cases, light should be going in to the camera, not coming from behind it. You might experiment with this, but a lot of my best results have come from when I don’t put myself (and my shadow) between my camera and the food. When I’m at a restaurant or cafe, I try to get a seat near a window or where there’s natural lighting, which tends to be less harsh than lamps or bright, artificial lights. You also might have to turn your plate or try different angles to get optimal lighting. This gets easier with more practice and pictures. Playing around with different angles will give variety to your food pictures. Angles are your friends! If the dish is served in a bowl, I might try taking the picture directly above the bowl (depends a lot on the lighting) or even at a 3/4 view. Depending on what you’re eating and what’s in the bowl, you’ll get different results. If I’m photographing a sushi roll, usually I position the roll at an angle and take the picture from the table so that you can see into the roll. With practice, you’ll get better at spotting great angles for different kinds of food. With regards to the food, make sure the plate is clean and that the background is clear. Before I take a picture, I usually check to make sure there’s nothing in the background of my picture (such as a napkin, glass, or a dirty utensil) and that the dish looks neat. If there’s sauce on the plate, I’ll wipe it before a picture. If there’s a leaf out of place, I might tweak the plating a bit. This helps give a polished look to the dish before the picture. These section is less about tips for improving your food photos and more about how to go about taking the picture. One of my favorite Wong Fu Productions sketches highlights how crazy food photography can get. So, here are some of things that I think about when I take pictures of food when I’m out and about. In terms of equipment, cellphone cameras work just fine. I don’t own a DSLR or a fancy camera, and I find that my food pictures still come out pretty good. This goes along with the tip about being mindful of the people around you. While there are definitely pros to getting a DSLR or really cool camera, they aren’t an absolute necessity for taking pretty food pictures. Be mindful of the people eating with you and around you. I try not to make my friends or eating companions wait too long when I take pictures. Either I take a bunch of pictures really quickly and crop/edit later, or I make sure that they have something to eat while I take pictures of another dish. Additionally, when I eat with people, I’m there to eat with them, not take just take pictures of the food. So, don’t spend too much time taking pictures of your food! Enjoying your food is just as beautiful and awesome as taking a picture of it. And, spending too long taking pictures means waiting longer to enjoy the wonderful food in front of you. Also, remember that there are other patrons trying to enjoy a meal, too. When I take pictures of my food, I try to do it quickly as to not make a scene and disturb the people around me. After all, all of us are there to eat and enjoy our food. Don’t make a scene. Personally, I try to be as inconspicuous as possible when taking pictures of my food. Be mindful of the restaurant and the people around you who are also trying to enjoy their meals. This is another reason I don’t use flash on my pictures; it attracts a lot of attention to what I’m doing. These are some simple things I keep in mind and are relatively easy to follow, even for people who are just starting out. Not every picture turns out great, and sometimes the lighting and environment gets in the way, but for the most part, I’ve been really happy with the results. Of course, don’t forget to enjoy eating the food, too. Happy food photo taking!